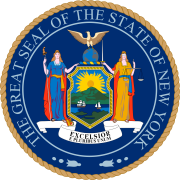 The 2014 New York Comptroller election took place on November 4, 2014, to elect the New York State Comptroller. Incumbent Democratic Comptroller Thomas DiNapoli was re-elected to a second full term in office. Incumbent Democratic Comptroller Alan Hevesi was re-elected to a second term in 2006 but resigned a few days before the term would have begun, as part of a plea agreement from charges relating to his use of state employees to chauffeur his wife, who was ill (Hevesi had been convicted before the election but still defeated Christopher Callaghan by 56% to 39%). He was succeeded as Comptroller by Democratic State Assemblyman Thomas DiNapoli, who was elected in a joint session of the New York State Legislature in February 2007. DiNapoli was elected to a full term in 2010 with 51% of the vote. Despite DiNapoli's relatively narrow win in 2010, Republicans do not believe that he is vulnerable because "Comptrollers seem to get re-elected as long as they do their jobs." They are instead concentrating their efforts on defeating Attorney General Eric Schneiderman, citing numerous reasons, including the fact that DiNapoli comes from Nassau County, as opposed to Schneiderman, who comes from the Upper West Side of Manhattan. Republicans initially found it extremely difficult to find even a paper candidate to fill the ballot line, with the Conservative Party saying it would nominate its own candidate if the Republicans didn't find someone. Onondaga County Comptroller Bob Antonacci stepped forward for the Republicans in May 2014. Under a pilot program approved by the New York State Legislature as part of the 2014 state budget, the comptroller election was to be the first statewide election in New York to be publicly financed. Republican candidate Robert Antonacci agreed to take part in public financing matching funds, noting that he would not have entered the race had those funds not been made available. To qualify for matching funds (which will be taken from a slush fund set aside for money unclaimed by the state's citizens), he had to raise $200,000 from at least 2,000 donors, each of whom are limited to a maximum donation of $175; he can continue to receive much larger donations outside those he seeks to match. DiNapoli did not accept matching funds. Antonacci failed to qualify for matching funds and raised less than half of the money necessary to qualify. Antonacci later expressed dismay toward the New York Republican State Committee for failing to give him financial support and nearly quit the race. ^ Lovett, Ken (April 14, 2014). Mike Long says NYS Conservative party will choose own controller candidate if GOP can't (sic). New York Daily News. Retrieved April 14, 2014. ^ Breidenbach, Michelle (May 7, 2014). Antonacci would be first to use public money in statewide campaign against Comptroller DiNapoli. Syracuse Post-Standard. Retrieved May 8, 2014. ^ Reisman, Nick. Antonacci not quite on the air with 1st ad. Time Warner Cable News. Retrieved October 6, 2014. ^ Fredric U. Dicker (October 27, 2014). Astorino: Cuomo is becoming ‘unhinged’ by campaign stress. New York Post. Retrieved October 27, 2014. ^ "DiNapoli nominated for re-election as comptroller". Olean Times Herald. May 21, 2014. Retrieved August 21, 2014. ^ Republicans eye Antonacci for state comptroller. Gannett. Retrieved May 1, 2014. ^ Gormley, Michael (May 7, 2014). Republican says he will take on state comptroller DiNapoli. Newsday. Retrieved May 7, 2014. ^ a b Dan Janison (March 23, 2014). "Comptroller Tom DiNapoli awaits a challenger for the fall". Long Island Newsday. Retrieved March 23, 2014. ^ Benjamin, Elizabeth (August 12, 2013). Chris Jacobs: Thanks, but no thanks on DiNapoli challenge. YNN. Retrieved August 12, 2013. ^ Candidate petition list, from the New York State Board of Elections. Retrieved August 25, 2014. ^ a b "Candidate Petition List". elections.ny.gov. Retrieved September 26, 2014.